It is often said that to understand Plato we must understand his times. Many readers who might accept without question this saying of historical criticism may still wonder why we should think it necessary to begin our enquiry as far back as Homer and beyond. In the case of Plato there is an even greater need to pursue the argument back to the very beginnings of the historical period in which he lived and worked.It is quite impossible to understand the genesis of Plato's ideas without understanding the profound change that Greek society underwent in the post-Homeric period that preceded him. This change in social structure created a mercantile, progressive Greek society, one which laid the foundations for all the subsequent history of Europe and the West. 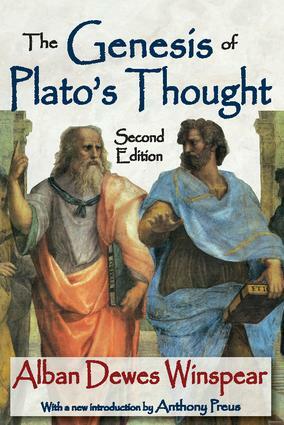 The Genesis of Plato's Thought is particularly highly regarded because it departs vigorously from the traditional abstract, static view of Plato's thought.Winspear's volume on Plato's thought traces, in a realistic fashion, the deep-reaching social and economic roots of Plato's concept of the state and society. Winspear believes that nowhere can the social roots of philosophy be more sharply seen and more firmly apprehended than when one is dealing with the origins of Western philosophy among the Greeks. His book contains the body of information which any reader should have if they wish to approach Plato as a historical figure. To make the book useful to a wide circle of readers, brief biographical identifications for the various important figures of Greek life are introduced in the text. The Argument with Thrasymachus— What Is Justice?